KATE SEELYE, correspondent: On the outskirts of Cairo, members and supporters of Egypt’s Muslim Brotherhood celebrate the start of a new political era. With nearly half the seats in parliament, the party is set to wield significant influence in Egypt. Newly elected deputy Azza al Jarf calls Egypt’s first free election in decades historic. The Brotherhood has been waiting a long time for this moment. Formed in 1928 to promote Islam, it was later banned in Egypt and its leaders repeatedly imprisoned. But as secular autocrats have collapsed from Tunisia to Egypt, Islamist parties have stepped into the political vacuum, and groups like the Brotherhood are now riding a wave of popular support with their calls for social and economic justice. On election day in a poor Cairo suburb, Muslim Brotherhood candidate Mohammed Beltagy spelled out the party’s goals. MOHAMED BELTAGY: We were oppressed and intimidated for 80 years, but today we are about to embark on a long journey to meet the needs of the people. SEELYE: Beltagy and his party weren’t the only Islamists voted into parliament. The Noor Party, which advocates a more fundamentalist agenda, won nearly a quarter of the seats. Together, Egypt’s Islamists make up more than 70 percent of the new parliament. Liberal and youth parties account for the rest. Blogger Mahmoud Salem, who ran and lost in a district of Cairo, says youth candidates like himself didn’t stand a chance against the better known and funded Islamists. MAHMOUD SALEM: The issue is that if you’re a party that only started three months ago you don’t have the chance to create the groundwork that is necessary. You know, as opposed to the Muslim Brotherhood who’s been around for 80 years, you know. So people vote for whoever they see in front of them. SEELYE: It was young, secular Egyptians like Salem who sparked last year’s protests with their demands for justice and freedom. They were been sidelined in these elections, but Salem say he has no regrets. SALEM: Now we get to play the role of the opposition, which is so much more fun, you know: Hey, Islamists, you wanted power? Fantastic. I want social justice now. Get it done. SEELYE: But others worry democracy has been hijacked by parties they say have little respect for personal rights and freedoms. PROFESSOR SAID SADEK (Professor of Political Science, The American University in Cairo): It is scary on many issues, especially the social issues, minorities, Christians. Also the status of women, civil liberties, personal liberties in general. What are they going to do with them? SEELYE: Sadek says Egyptians have legitimate concerns about this parliament’s intentions, given the poor human rights records of Islamist-run countries like Sudan and Iran. 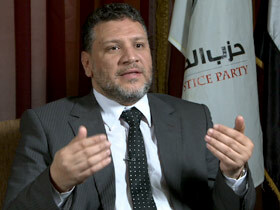 SADEK: Islam has many variety of readings and many interpretations. If they are going to adopt a moderate version, we all support them, but if they are going to adopt a very strict interpretation and they want to impose it on others, we’ll have trouble. SEELYE: But in this working-class Cairo neighborhood, shoppers have other things on their mind. Many are struggling to get by. At this local food bank shoppers are snap up macaroni and lentils at wholesale prices provided by the Muslim Brotherhood. Nearly half of Egypt’s more than 80 million citizens live on less than two dollars a day, and economic despair fueled last year’s anti-government protests. 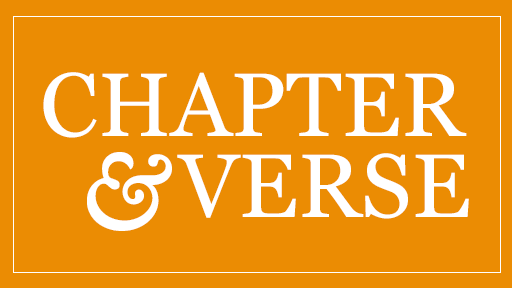 For decades, the Brotherhood has provided for the poor, offering free health care, education, and other services. Now voters are hoping that the Brotherhood’s history of charitable work and its promises to improve people’s lives will lead to real change. RAMADAN (Man at Food Distribution): The past government was dishonest. We hope the future will bring reforms. SEELYE: Egypt faces many challenges. Buildings burned during last year’s protest are reminders of the country’s ongoing instability. Investment is down dramatically, as is tourism, which employs more than 10 percent of the population. Unemployment is surging. Corruption is rife. Given the country’s deep problems, the Brotherhood’s leaders say their priorities will be rebuilding Egypt’s economy and infrastructure, not pushing religion. Ossama Yassin is a Muslim brotherhood deputy in parliament. OSSAMA YASSIN (Member of Parliament): We don’t want what’s known as a religious state. We want a modern, civil, democratic state belonging to the people. SEELYE: Sensitive to concerns about an Islamist agenda, the Brotherhood has been moderating its religious language and emphasizing its respect for the rights of other religions and groups. YASSIN: There is no basis for the liberals’ fears. The state we seek will guarantee freedoms and rights, like the freedom of religion and speech, the right to form groups and political parties, and the right to demonstrate. SEELYE: By contrast, the Noor Party is calling for a religious state. This summer many of its fundamentalist supporters, known as Salafists, gathered in Cairo to demand an Islamic caliphate. Salafists once shunned democracy, claiming it gave the laws of man precedence over those of God. But today democracy offers them a chance to press for harsh religious legislation. 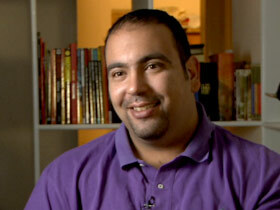 Tarek Shaalan is a founding member of the Noor Party and holds a PhD from the University of Central Florida. He says his party seeks social justice and the strict application of Islamic law, including banning alcohol and segregating the sexes on Egypt’s beaches. TAREK SHAALAN: The reason I want to make it segregated so I want to make the woman feel more comfortable, you understand me? Don’t look at Islam that we’re bringing a problem. No, we bring the solution, not the problem, okay? SEELYE: Hard-line Salafist views have proliferated on religious channels here. It’s not uncommon to hear preachers like Yasser Borhami, a founder of the Noor Party, accuse Christians and Jews of being infidels. This kind of talk deeply worries Egypt’s Coptic Christian community of more than four million. Over the past several years, attacks on their community have grown. Churches have been burned and Copts killed. Salafists have been blamed for inciting sectarian violence, a charge Shaalan denies. 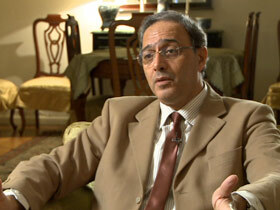 (speaking to Tarek Shaalan): You acknowledge that there have been growing attacks on Christians in this country? SHAALAN: Well, I don’t want to see it this way. It’s not because of religion. It’s because of lots of other things, you know? SEELYE: The Noor Party’s positions have been criticized by the Muslim Brotherhood. The two Islamist parties are rivals, but in Cairo cafes where Egyptians debate the future, some worry that Noor’s ultraconservative agenda may pull the Muslim Brotherhood to the right. The best protection for minority and women’s rights lies in the drafting of Egypt’s new constitution, according to Coptic community leader Mona Makram Ebeid, who is also an advisor to Egypt’s ruling military authority. MONA MAKRAM EBEID (Member of Advisory Council to the Supreme Council of the Armed Forces): I think the biggest battle now that we all must focus on is the constitution. 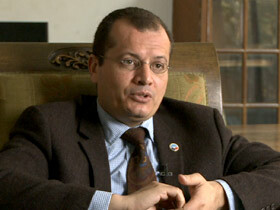 SEELYE: Makram Ebeid says parliament will appoint an assembly this spring to draft the constitution. 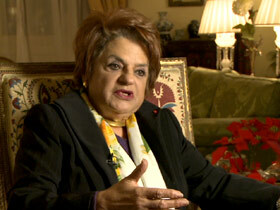 She insists it must address the concerns of all of Egypt’s communities. MAKRAM EBEID: I hope that the majority of the Muslim brothers, who are much more moderate and much more professional, will be able to have a fair constitution which takes into consideration the rights of every individual in this country, of every citizen in the country, whether it’s economic rights, social rights, political rights, religious rights, cultural rights. SEELYE: In Tahrir Square, where the protests began just over a year ago, demonstrators continue to demand those rights. Democracy is very fragile here. Egypt is now run by a heavy-handed military which took over when Mubarak stepped down. The generals say they’ll transfer power after presidential elections this summer, but some have doubts. Nevertheless, Islamists long banned in Egyptian political life have new responsibilities and a new sense of accountability. And Makram Ebeid believes that will have a moderating effect. MAKRAM EBEID: So I don’t think that they will be able so much to impose their own views or change the personality of Egypt as they wish, because I think that this will make them lose their popularity. The more there is an opening to democracy, the more the process of democratization will be, will go ahead, and the more they will come more to the center. SEELYE: While some might disagree, few dispute the importance of Egypt’s democratic opening. The test will be safeguarding the process so that future voters can choose to re-elect their parliamentarians or not. For Religion & Ethics NewsWeekly, I’m Kate Seelye in Cairo.